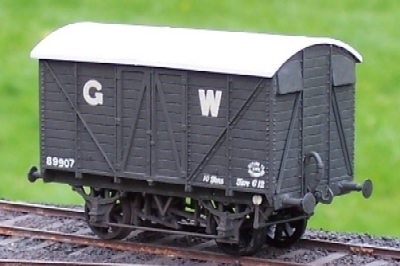 In 1902 the GWR introduced the standard 16' long van. The first design was later called V5. They were built from 1902-4. Initially rated at 9 tons, later increased to 10 tons. Their dimensions were similar to the iron vans that had been built, but 6" taller. Next came a design later called V4. They were built from 1904-6 in two sizes. These vans were both taller and wider than V5. This is the shorter V4 design. The inside heights were 7' 6" tall compared to 8' of the taller V4's and only 7' for the V5. All three designs of vans so far had standard DCI brakegear. The next design introduced in 1907 was called V12. By now the diagram book has been set up. 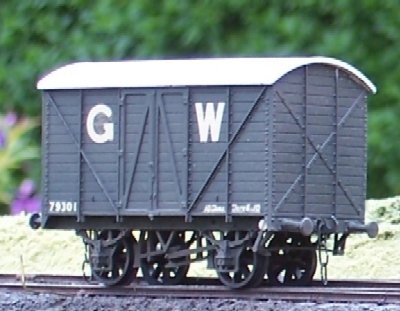 The body dimensions remained the same as V4 short. But the ventilation of the van was changed to a pair of Shuttered Louvres. There was also a change in brake gear. The DCI brakegear was replaced by DCIII, some were also fitted with vacuum brakes. The next design was introduced in 1909. 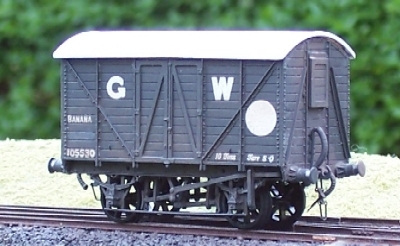 V13 vans were specifically built for carrying fish. From photographs it appears that they were identical to the vacuum fitted V12's, but with slots in the sides at floor level. These vans were later rebuilt, the end ventillators removed and ventilation was primarily through roof vents. In 1927 they were moved from the Merchandise Vans diagrams to the Fish Wagons diagrams and called S2. 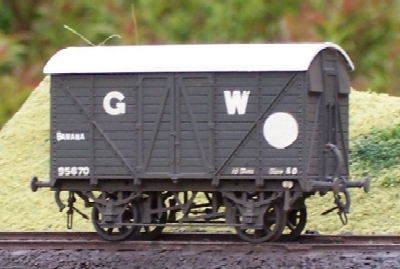 This model shows an S2 in its final GWR livery. V14 appeared in 1912. 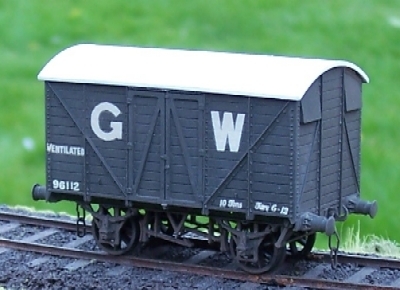 The main change was again to the ventilation with the twin shuttered louvres being replaced by twin bonnet vents at each end. 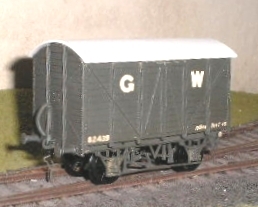 The last of this design also had the new GWR self-contained buffers. Appearing at the same time as V14 was V16. 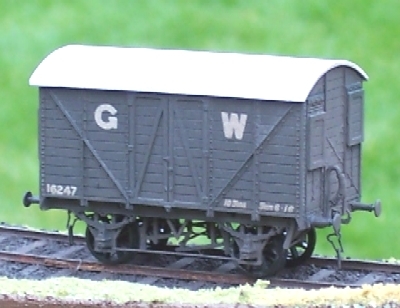 These vans were the same a V14 but only with hand brakes. 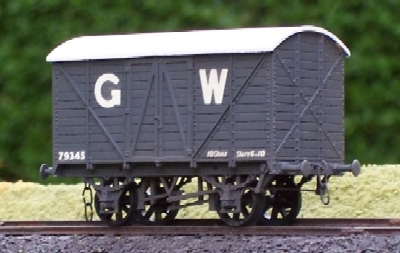 Note the missing design, V15, were some iron vans purchased in 1913. Built during the Great War, V17 were built for overseas use. 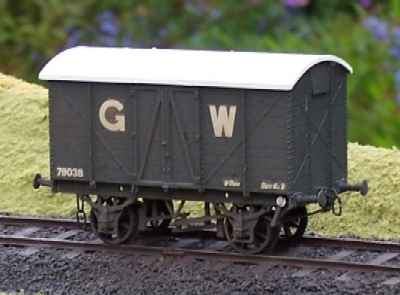 The next design change occurred in 1923 when the GWR's favoured DCIII brake was changed to the Morton brake. 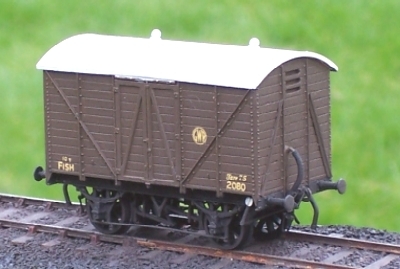 V18 vans were built both with and without vacuum brakes. If there is one thing that the GWR were consistent about, it was that sometimes design changes, such as vacuum brakes, warranted a separated diagram and sometimes they didn't! I haven't modeled the V18, but you can image one by combining the body of the V14 above with the underframe of the Y12 below. That almost completes the story of the 16' General Merchandise vans. In 1927 the design changed to 17'6" long and there were even more versions of the 17'6 van than the 16' van over the next twenty or so years.